We lost one of our green English budgies. She was acting like she was going to lay an egg, her nares indicated breeding condition. She was spending time at the bottom of the cage, but was still flying and eating. She passed yesterday. There were originally four, giant, green english budgie females. One passed last year. I think they are old. The ones that passed seemed to be almost blind, also. We had placed the three English Budgies in a flock with about twenty other American Budgies. They all seemed pretty happy in the flock in the big flight cage. Many had been adopted out, but when we were down to four, the three english girls and an American (I can't tell the gender with his coloration), we decided that we would not separate them further, and declared that the four would be adopted out as a flock. Now that we are down to three, probably two females and a male, Im wondering if the dynamics will work. Two of the three seem to be bonded now. We have a pair of male budgies in a different cage who have always lived together. They are tiny (32g and 49g). I wonder if we should make a flock of five? It seems much harder to adopt out a flock, but I think they're happier in the rescue in the flock than they would be as a single in a home. Sad to lose this budgie, but I think she was as happy in our flock as she would have been anywhere. Ohhh, poor thing! Budgies don't really last as long as they should because they have all been so very overbred that, by now, they are all weak specimens... and, of course, the fact that most people just give them seeds makes it worse. I would put them together, John. Three is not a good number for budgies and the males will like being with females. As to the one that you cannot tell the gender, if it hasn't gotten a brown crusty cere in all the time it has been there, it's a boy. The pair of tiny male budgies has been adopted, so I guess we will have to deal with a flock of three. Alex was adopted yesterday! He had been our office bird. He’s a good little guy. AWWWW! 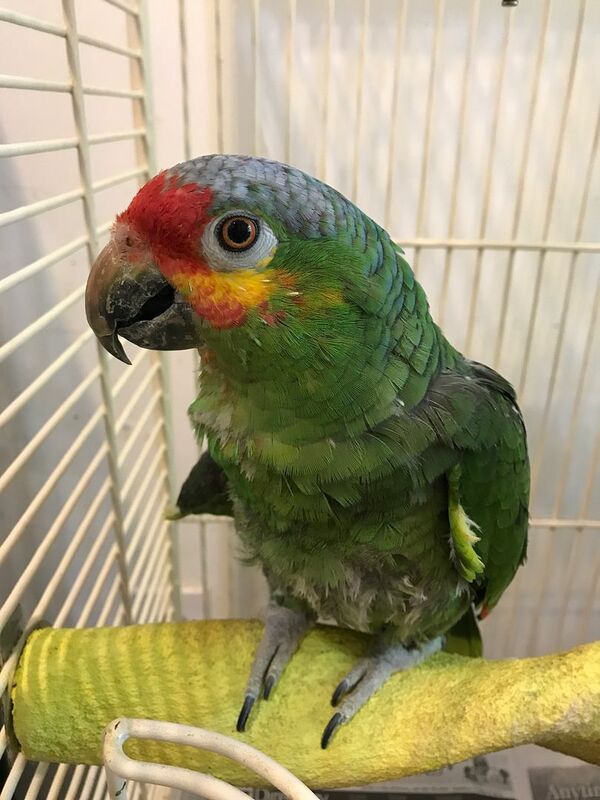 He looks like my Pretty Bird! Great news!!! Athena, one of our little Yellow-shouldered Amazons went home on Thursday. She’s a very chill little Amazon. I’ll miss her. These two, OJ and Fiona, got adopted a while ago. We receive regular updates on how they're doing. They have had a great life in their new home. Yesterday we received word that OJ had passed away. Fiona is very upset, as you can imagine. I don't really know what happened to OJ, but these birds, especially the lories, don't seem to be able to escape their pasts. I don't know OJ's age. Maybe it was just his time. I'm pretty upset about it. Fiona was my baby and she loved me. OJ would tolerate me if I had Fiona. He'd bite me occasionally, just to remind me that he could. (Not that bites from a lory really count as bites. 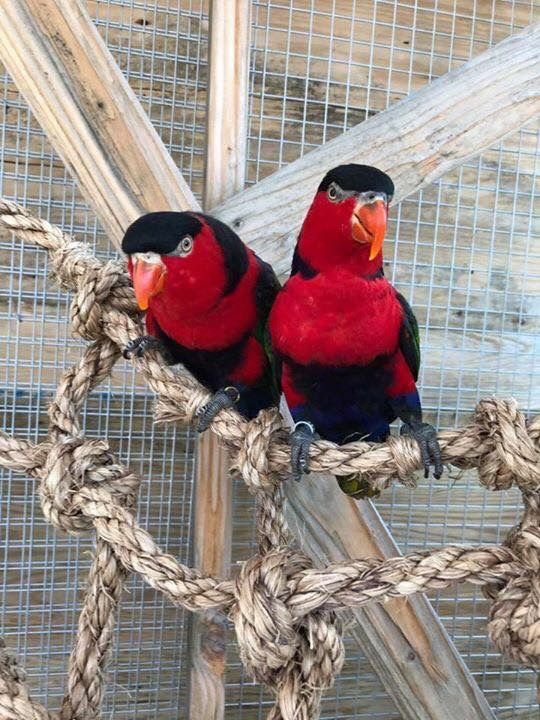 We do have another black Capped Lory at the rescue. I don't know for sure if Livy is a male or female, but he and OJ would fight if they could get to each other. I suspect Livy is a male. I wonder if Fiona would take to him now? Last edited by Navre on Sun Jun 03, 2018 6:06 am, edited 1 time in total. Is it a thing for breeders to band males on the left and females on the right? Most of the Weston birds seem to follow this pattern. We don't know the gender of all of them, but ones I suspect by behavior tend to follow this pattern. OJ and Fiona followed this pattern. I don't know about that, John, because, unless the breeder does a DNA test almost right after they hatch [and who would be SOOOO cold-hearted to take blood or pull feathers from a newly hatched baby?! ], how would they know early enough for them to be able to put the band on the leg? They need to band when they only days old or the toes can't be bent for it.